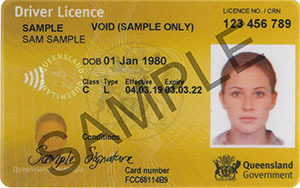 Queensland licence cards include a variety of technological and visual security features to provide a higher level of security and protection against identity theft and fraud. The security features also make the cards difficult to replicate and make it easier to identify forgeries. Facial image recognition is a form of biometric technology that uses special equipment and software to measure key facial features depicted in a digital photo, such as the distance between your eyes, nose and mouth. The software then compares the characteristics of this photo with the characteristics of other photos stored on file. It is unlikely that 2 people share exactly the same facial characteristics, including identical twins. When you apply for a new card, your facial image and signature will be captured digitally and securely stored. Prior to your card being issued, your facial image will undergo an image identification one-to-many comparison to all facial images that are currently stored on the Department of Transport and Main Roads licensing database. If your facial image matches another customer record, the card will not be issued and the matter further investigated. Where appropriate the matter may be referred to the Queensland Police Service for further action. If you conduct another transaction with us, for example you apply for a replacement driver licence, your facial image will undergo an image verification one-to-one comparison with your previously stored facial image. This process helps prevent people from unlawfully obtaining multiple cards under different names, which helps reduce identity theft and identity fraud. The Department of Transport and Main Roads is committed to ensuring that all personal information including, digital photos and digitised signatures is managed in accordance with the relevant transport legislation, the Photo Identification Card Act 2008 and the Information Privacy Act 2009. You must apply in person when you first get your licence. This is so that the Department of Transport and Main Roads can take your digital photo and digitised signature, and undertake the necessary checks associated with facial image recognition. Facial image recognition will ensure a person has only one licence, authority or photo identification card of the same type. For improved security, the cards are printed and distributed from a secure central location to your mailing address. The supplier has contractual obligations to meet strict privacy requirements in the production and distribution of the card. The Information Privacy Act and relevant transport legislation set out strict guidelines for the collection, storage, use, disclosure of digital photos and other personal information. Additionally, Transport and Main Roads ensures personal data is securely transmitted and stored either through restricted access or encryption. Encryption is a process that is applied to data to transform it into an unreadable format. A decryption process is used to make the original data readable again. The Transport and Main Roads’ encryption and decryption processes use industry standard algorithms accepted by recognised security authorities. Officers authorised by the Department of Transport and Main Roads have access to digital photos for licensing transactions and licence-related enforcement under the Transport Operations (Road Use Management) Act 1995 and other transport legislation. in an emergency if the officer reasonably suspects that there is an actual or imminent serious risk to a person’s life or health or to public health or safety, and immediate access to the photo is likely to enable a police officer to take action to reduce that risk. If you have an enquiry or complaint about the use of your personal information please email privacy@tmr.qld.gov.au or contact the Department of Transport and Main Roads.